"Tableau is a business intelligence and data analysis system that helps companies visualize and understand their data. " 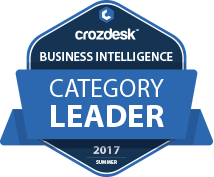 Tableau scored 87/100 in the Business Intelligence (BI) category. This is based on user satisfaction (82/100), press buzz (56/100), recent user trends (rising), and other relevant information on Tableau gathered from around the web. 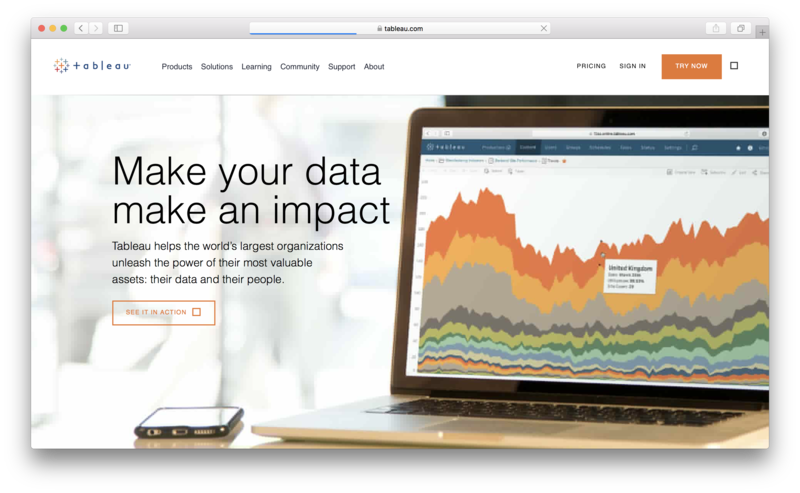 Tableau is a business intelligence (BI) software solution designed to help businesses, organizations and decision makers transform raw data into actionable insights, leading to more effective and wiser business process decisions. This BI solution provides organization users the ability to quickly find the right answers to specific questions regarding their data in real time, thus promoting smarter and more productive department heads and decision makers. Tableau Business Intelligence Software is actually an integrated system that offers core BI solutions and data analysis. It facilitates key data analysis for users in order to provide meaningful insights from the raw data presented. The software solution starts with the process of collecting raw data from multiple sources like SQL databases, spreadsheets, Google Analytics, Salesforce and other cloud-based software. The system then creates a collective dataset that highlights the crucial points for the user. The solution’s live visual analytics and interactive dashboard enable users to dissect datasets in order to efficiently generate crucial insights from the data and allow the company’s decision makers to find new opportunities to explore. With Tableau, users can build interactive maps and carefully assess information across different regions, demographics and territories. The system essentially helps to create a complete narrative based on the gathered data, a narrative that’s easier to comprehend and analyze, employing interactive visualizations that can be disseminated and shared with stakeholders and other decision makers in the company. Tableau business intelligence software solution offers quite a few benefits for all users aside from helping to analyze data in such a manner that enables decision makers to steer the company in a profitable direction. Tableau is a robust system, but despite its incredible power, the software solution is actually user-friendly. Users don’t have to be an expert or require special training to manage the service. The solution employs a drag-and-drop mechanism, which makes it possible to obtain data for analysis in a practical and efficient way. The point is Tableau is a type of product that is intuitive even for non-savvy individuals. It doesn’t require much time to get familiar with as it doesn’t require programming knowledge or costly specialized training. Connectivity with other data sources. Tableau BI and data analysis offers a productivity suite that allows for quick and easy integration with a number of existing data sources your company might already be using. It lets you import and visualize recently gathered data in a few simple steps. This is largely due to the advanced technology and practical data analysis platform incorporated into the software. Impeccable customer service and support. Tableau BI software solution offers great customer service by providing its clients with complete access to a dependable tech support team. They also automate the data updates and other major processes to address your company’s needs in the most practical and efficient way so you don’t have to waste time, effort and resources to obtain new data for analysis. Competitive pricing and easy flexible deployment. Tableau provides two types of deployment for customers to choose from: via cloud or on-premise. They also offer annual subscriptions and single-payment licenses to address the capacity and needs of different organizations and businesses. It’s because of Tableau’s flexible policy, deployment and pricing that makes it accessible to small- to medium-sized businesses and large conglomerates. Tableau offers very flexible and competitive pricing plans for businesses of all sizes across different industries. All packages—both on-premise and cloud-hosted solutions—are billed annually, but priced on a monthly basis. Tableau Core BI and Data Analysis Solution is a robust system packed with all the right features to help users gather and understand their data from one convenient location. The service is flexible enough and priced competitively that even small businesses and startups can have access to it. It’s definitely worth checking out. What are some applications Tableau is commonly used in tandem with? Does Tableau offer guides, tutorials and or customer support? What platforms does Tableau support? Does Tableau offer multi-user capability (e.g. teams)? What is Tableau generally used for? Does Tableau integrate with any other apps? Who are the main user groups of Tableau? Does Tableau offer an API? 4.11/5 based on 1349 user ratings. What do you like about Tableau? What do you dislike about Tableau? What have you been using it for and what problems did Tableau solve? Tableau is a great platform when it comes to marketing research and analytics. Utilizing the software's many visual dashboard layouts, graph types, and options helps to display visual representation of key metrics and KPIs. Using the platform, users are able to convert vast arrays of raw data into actionable business insights that help to foster collaboration and strategic decision making. While the many core features and functionality are great, one of the major drawbacks is how long it takes to properly learn to use the software. The basics are relatively simple, but it takes some time for users to truly learn the ins and outs of the system to leverage it to its full capabilities. In effect, the software is highly nuanced, thereby making some features harder to use than expected. My organization has been using successfully utilizing Tableau in order to generate visual dashboards. This has proven to be very helpful when it came to preparation of materials for senior management and as well the creation of easy to follow presentations. Overall, this is a wonderful software that could benefit many organizations. It's especially reasonably priced as well which is a major plus for companies on a tight budget. There's nothing in particular i dislike about tableau. Keep Innovating, you're awesome! We use it internally to track sales and projects and have it linked to our cloud data warehouse. We also help train on the tool and have found the suppiort for born incredible. Creating dashboards to visualize data has never been so easy. Very intuitive and powerful application to create dashboards out o data. Inexpensive as compared to the amount of money saved by taking data driven decisions. User restricted access helps to determine who views the data. Very well.integrated with other applications to fetch data. Needs quite some time to gain experience in creating dashboards. To create customized dashboards one has to have knowledge of programming language. Making decisions out of data is very important as it helps to save a lot of money and make informed decisions. Helps to quickly have a look at the dashboard which conveys the same message as hundreds of excel file. This tool is powerful for organizing statistical data. The statistical data can be visualized better with Tableu. It is very easy to use and analyze this tool. I use it to keep in order the statistical data on trends of new assignments and projects that we manage in the organization. Ideal for the use of conferences, trainings, trainings and important announcements in matters of entrepreneurship. Tableau does not handle security criteria and verified security. It is a mistake not to have this option. It leads to distrust about the use of key information within our organization. Manage volume information on trends in personal and professional matters within the organization. We use this tool to facilitate the work of organizing statistical information in blocks. Tableau to present reliable data quickly and easily. It is an excellent program to be able to relate databases and combine them from different sources, the presentations in the Dashboards are easy and easy to understand, they can be visualized on your computer and on mobile devices, each user has their profile which they can share with a link and you can visualize the information from where you are in real time. When I am doing an update of my data and I want to add to the Dashoboard it sometimes gives me an error, which does not allow me to save the changes I have made and I must start again, if I have several open Dashoboard it sometimes gets a bit slow. I'm using it basically to keep the databases organized and to perform analyzes and presentations quickly and reliably, sometimes I need to know statistical data and tableau is a good option, you can present your information with various types of graphics even with maps, Publish workbooks and data sources in Tableau Server and Tableau Online. This software helps me keep all the databases of the company organized, fast and with reliable information, I can share it in my profile and with a link you can view it from any place and at any time, you can see it through its mobile devices, tablets and desktop computers, I can make presentations with Dashboards, where you can see graphs, calendars, maps among others. What I do not like about this application is that sometimes when I'm doing the Dashoboard after I make the changes and save it gives me an error and it does not allow me to save the changes made and often it gets a bit slow. I use it because it is an excellent tool that has helped me to organize all the databases that we use in the company and thus be able to show statistical data in an easy and fast way, I can make a presentation through Dashoboard which I can incorporate filters, maps, diagrams, calendar, among others, the best thing is that you can see from mobile devices, tablets and computers with just a link, through a profile which I can always have updated.